Within a period of 48 hours, four financiers "committed suicide", most under suspicious circumstances. ZetaTalk Explanation 9/19/2009: What wealthy individual commits suicide by gunshot in a parked car, where McDonald was found, or in an alley where Capserson was found? And of all means to end one's life, aspirin, Kelly's apparent pill of choice, is hardly the exit of choice. Of the four Pang was under house arrest, Kelly was to begin a prison term, and Casperson was being investigated for tax evasion, but none of this is fodder for suicide. Madoff is serving his life terms without this resort, for instance. These four suicides are indeed suspicious, as they should be, as they are not suicides. Since this occurred just after Obama went to Wall Street to lecture on financial responsibility, and planned to overhaul regulations of financial institutions, the rumor mill went wild, claiming a failed assassination attempt. Obama's speech in New York will push Congress to take action on regulatory reform to prevent the kind of tailspin that the economy went through last year. Obama has called on Congress to pass a sweeping overhaul of how financial institutions behave. The circumstances of each "suicide" indeed look suspicious - gunshot in an alley, gunshot behind a car dealership, Aspirin (Salicylate) overdose, which is a lingering death taking days. The common denominator was that they all worked in the financial field. Two of the four were shady characters, obviously willing to break the law to get rich - Pang and Kelly - but the other two were upstanding citizens. Police are investigating the death of the former chief fundraiser for ex-Illinois Gov. Rod Blagojevich. Christopher Kelly, 51, was former Illinois Gov. Rod Blagojevich's chief fundraiser. Financier Christopher Kelly told police shortly before he died Saturday that he took an "overdose of drugs." Kelly pleaded guilty to two counts of mail fraud "in a kickback scheme to bring in $8.5 million in business at O'Hare International Airport to his roofing company." Kelly was to begin a prison sentence this week, the Tribune reported. Per the Zetas, those who put Bush in the White House in 2000 and 2004 were boiling over with frustration, having failed repeatedly in their plans to incite martial law and sculpt the population to their liking. These plans were blocked during the Bush administration, and continue to be blocked. ZetaTalk Explanation 9/19/2009: During the Bush administration we talked about behind-the-scenes wars, where a contingent of people in the Justice Department, the FBI, and in Congress were determined to keep the criminal cabal that had taken over the White House from achieving their goals. This war has not changed, but the field of battle has shifted. Bush was not able to plant WMD in Iraq, nor been able to declare martial law, and those associated with the Bush administration were not able to move forward with their plans to exterminate tens of millions via chemtrails using US military planes or via vaccination programs, but the hope still lives on. Was an assassination of Obama attempted or planned? Per the Zetas, the answer to this lies in the hasty means by which several financial henchmen were "suicided". Those at the helm of such plans are severing the paths that lead to them, eliminating henchmen who might be tempted to talk to investigators. This is a certain clue to a secret war going on behind the scenes. There was a report that forces loyal to Obama thwarted an assassination attempt by rogue CIA-Mossad terror cells on the day of a scheduled speech on Wall Street. And supposedly four men were "suicided", among them: California's Danny Pang, their "Chicago money man" Christopher Kelly, their "East Coast moneyman" Finn Casperson, and, most importantly, the main financier and "conduit to the Globalists" James McDonald, chief executive officer of investment management firm Rockefeller & Co. Is there any truth behind this story? ZetaTalk Explanation 9/19/2009: This group, which does include Israelis, wants to remain in control of Iraqi oil fields and add the oil fields in Iran and Saudi Arabia too. Obama is pulling out of Iraq, resisting any plan to bomb Iran, and is even chiding Israel for their continuing land grabs. This group was able to make the rich get richer during the Bush administration and despite the Wall Street crash in the fall of 2008, still expects this to be the status quo. Obama is taking steps to counter this trend and cap and limit what the greedy can grab. But Obama has many enemies, among them Wall Street barons, military contractors or suppliers, health insurance executives, lobbyists, the wealthy, and white supremacists. But not all these enemies would take the step of attempting to assassinate Obama. Operations such as this require insiders, those who can be bribed or intimidated or blackmailed, and those who are sympathetic to the cause. But as the movies so aptly show, bugs can be planted, insiders can give away the plan by their actions and body language, criminals can get nervous and start to cooperate with authorities, and insiders can be double agents from the start. All of these elements trip up a plan when it is set in motion. Wall Street is where most of the wealthy house and increase their wealth, and for Obama to lecture these individuals while taking away their source of wealth was more than some could bear. The Bush administration allowed rampant financial crimes, but Obama has begun to prosecute in earnest. The assassinations were not done by the Obama administration, which planned arrests and investigations, but by those fearing that such investigations would lead back to the real increasingly ill at ease. The game is up, so they will begin circling their wagons. Watch for this. Where oh where have the sunspots gone? 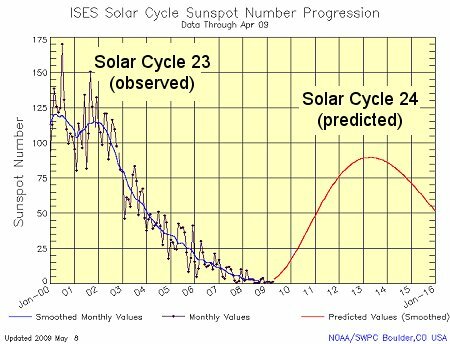 As we pointed out last year in the July 16, 2008 newsletter, this solar cycle has a dearth of sunspots. Records continue to be threatened. Sunspots are related to magnetism, as they are caused by magnetism, and are in fact a mini magnetic field on the surface of the Sun. The sun is in the pits of the deepest solar minimum in nearly a century. Weeks and sometimes whole months go by without even a single tiny sunspot. The quiet has dragged out for more than two years, prompting some observers to wonder, are sunspots disappearing? 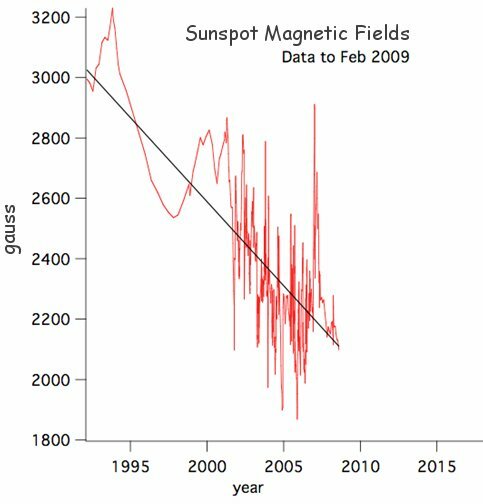 The NSO has been measuring the magnetic fields of sunspots for the past 17 years, and found a remarkable trend. Sunspot magnetism is on the decline. This disappearing act is possible because sunspots are made of magnetism. The "firmament" of a sunspot is not matter but rather a strong magnetic field that appears dark because it blocks the upflow of heat from the sun's interior. In explaining the lack of sunspots, the Zetas have pointed to the magnetic field of Planet X as the cause. Planet X is increasingly pointing its magnetic N Pole toward Earth as it leaves the Sun and heads outbound. It is thus pointing its magnetic S Pole at the Sun. This has a quieting effect. ZetaTalk Explanation 6/21/2008: During the last solar cycle, it was noted that solar activity was unusually high, and predicted by man that this cycle would be extreme. At the time, Planet X was passing the Sun and had its prolific magnetic N Pole pointed toward the Sun, nosed into the Sun's magnetic S Pole. We stated that such solar activity due to the presence of Planet X was merely a ruffled surface, and nothing more significant than that. Now the magnetic N Pole of Planet X is pointed outward, as Planet X has risen to the Ecliptic and is into its first 270° roll. Thus, it is pointing its magnetic S Pole toward the Sun, which absorbs magnetic particles and thus has a quieting effect. All the predictions that man made about this solar cycle being horrific, worse than the last cycle, have been forgotten. Such is the ego of man, wrong again. Indeed, NASA is struggling to explain what is happening, as the last thing they want to announce is the presence of Planet X. To buy themselves time, they are now announcing that the solar maximum is pushed out into the future. We're just having a long, long minimum, is their explanation. An international panel of experts led by NOAA and sponsored by NASA has released a new prediction for the next solar cycle. Solar Cycle 24 will peak, they say, in May 2013 with a below-average number of sunspots. The latest forecast revises an earlier prediction issued in 2007. At that time, a sharply divided panel believed solar minimum would come in March 2008 followed by either a strong solar maximum in 2011 or a weak solar maximum in 2012. Competing models gave different answers, and researchers were eager for the sun to reveal which was correct. Right now, the solar cycle is in a valley--the deepest of the past century. In 2008 and 2009, the sun set Space Age records for low sunspot counts, weak solar wind, and low solar irradiance. The sun has gone more than two years without a significant solar flare. The Sun, with a solar minimum that never ends, is not the only embarrassment for the establishment, which at all costs does not want to admit to the presence of Planet X near the Sun. The cover-up over the presence of Planet X has lots to worry about. For instance, there is the increase in noctilucent clouds. As noted in the August 9, 2009 newsletter these clouds are on the increase, and this just since Planet X arrived in the vicinity in 2003. There are greasy elements in the tail of Planet X which wafts toward Earth, causing not only these noctilucent clouds but also Moon and Sun halos. But there must be some reason NASA can give to the public for the increase in noctilucent clouds. How about this - exhaust particles from the exhaust of NASA's very own rockets, which were sent aloft to study these clouds. Now which came first, the rocket or the noctilucent cloud? The Black Brant XII Suborbital Sounding Rocket was launched to study the Earth's highest clouds. The light came from an artificial noctilucent cloud formed by the exhaust particles of the rocket's fourth stage about 173 miles high. Natural noctilucent clouds, also called "polar mesospheric clouds," are "found in the upper atmosphere as spectacular displays that are most easily seen just after sunset. The clouds are the highest clouds in Earth's atmosphere, located in the mesosphere around 50 miles altitude." Normally, noctilucent clouds are not visible to the naked eye and can only be seen when illuminated by sunlight below the horizon. The launch took place at 7:46 p.m. Saturday, just as the sun was setting for the day. ZetaTalk Prediction 3/1/2003: Yet another trend recently emerging is noted in the atmosphere, where imaging from above the Earth reports a sheen, or other abnormalities are noted. What is causing this new trend? The atmosphere, from its blue hue to its swirling motion, is affected by many particle flows, as well as the normal composition of air flowing up or down. We are telling you to expect that your upper atmosphere, your sky, may change color! The Earth wobble is another point of consternation. Where this causes sunrise and sunset locations to be not where expected, anyone in the public noting or reporting this is brushed off with the explanation that they don't know how to read an Azimuth to compute the absolute location of the Sun. But when the tides unexpectedly rise along the entire East Coast by two feet, this is a bit more difficult to explain. Tides are published well beforehand, so a missed prediction must be explained. Well, NOAA has explained the tides, but is honest enough to admit they do not know the cause of these aberrations. Sea levels rose as much as 2 feet (60 centimeters) higher than predicted this summer along the U.S. East Coast, surprising scientists who forecast such periodic fluctuations. The immediate cause of the unexpected rise has now been solved, U.S. officials say in a new report. But the underlying reason remains a mystery. Now a new report has identified the two major factors behind the high sea levels-a weakened Gulf Stream and steady winds from the northeastern Atlantic. This summer, for reasons unknown, the Gulf Stream slowed down,, sending water toward the coasts-and sea levels shooting upward. Adding to the sustained surge, autumn winds from the northeastern Atlantic arrived a few months early, pushing even more water coastward. But the underlying puzzle remains. "Why did the Gulf Stream slow down? Why did the fall wind pattern appear earlier?" NOAA's Edwing said. "We don't have those answers." ZetaTalk Explanation 5/19/2007: We predicted years ago that high tides unrelated to tsunami from quakes would be occurring, unrelated to any usual cause. What is the cause? When no quakes, adjusting the area, or severe storms in the immediate area can be pointed to, such high tides are caused by the Earth wobble and lurch. Global Warming was supposed to be the boogyman responsible for Earth changes caused by Planet X, explaining erratic weather and intractable droughts. But this can hardly explain the overall rise in earthquakes, as perceived by the public who feel them, and the increase in volcanic activity. The public has become skeptical! A significant proportion of the population have become more sceptical about climate change and the link with man-made emissions of greenhouse gases despite the fact that the scientific evidence has become stronger. A survey of public opinion has found that 29 per cent of people believe claims that human activities are changing the climate are exaggerated compared with 15 per cent of respondents to a similar survey carried out in 2003. ZetaTalk Prediction 6/15/1996: The weather is blamed on global warming, the greenhouse effect, which in and of itself might be an explanation that would hold if weather were the only symptom. It is the heat from the core of the earth and the increased earthquake and volcanic activity that boggles these attempts at alternative explanations. In no way would the public accept a statement that warmer air is heating up the core of the Earth. Heat rises, and cold air drops, and for the core of the Earth to heat up under an influence from the surface, the surface would have to be warmer than the core, which clearly is not the case. And then there's the problem with earthquakes - how to ignore them when they rattle houses. The USGS has for years been omitting earthquakes from the databases and listing the magnitude as less than what occurred. To keep the public from suspecting, the USGS required quake reporting and statistics in other countries to be in synch, to wait until the USGS set the magnitude before making a report. This approach does not always work. An earthquake early Saturday injured seven people on the Indonesian resort island of Bali. The quake hit shortly after 6 a.m. local time, about 75 kilometres south of the island's capital of Denpasar, said the United States Geological Survey. The USGS put the quake's magnitude at 5.8, while Indonesia's Meteorological and Geophysics Agency said it was a more powerful 6.4 magnitude. ZetaTalk Comment 1/24/2009: What is in fact going on and what the public is allowed to know are two different things. If the globe were experiencing magnitude 8 quakes on a weekly basis, how would you know? They would be called magnitude 6 quakes, or eliminated from the database altogether if not in a populated area. The number of people who have become aware of a hum or rumble underground, or felt their house shake but find no quakes ever recorded by the USGS, is rising. The day your house falls down while the establishment claims no earthquake occurred is the day your element of doubt will cease, presumably. ZetaTalk Comment 7/5/2008: Nancy and others following the posting of earthquakes have noted since the start of ZetaTalk in 1995 that many earthquakes are omitted from the USGS databases, often after having been posted there - removed in front of the eyes of those watching the databases at the time. Other irregularities are that the magnitudes of earthquakes are reduced to a ridiculous degree. This has become commonplace now.